In under four years Winnow has worked with hundreds of kitchens of all shapes and sizes across 29 countries and counting. What this equates to is a saving of 13 meals at every minute, whilst inspiring chefs to come together and reduce food waste in their kitchens. Today we speak to Natasha Montagu, Client Success Executive for Compass Group UK & Ireland, one of the world's largest contract catering. 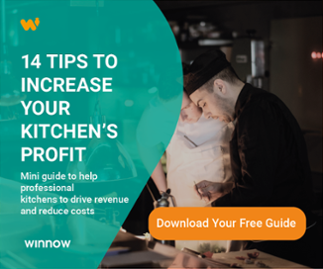 Based in Winnow’s Headquarters in London, she delves in her hotel management background and gives her thoughts on how chefs can successfully implement Winnow in their operation driving a more profitable kitchen. Why were you drawn to a career in hospitality? It was the next logical step after studying at the highly respected and renowned Les Roches International School of Hotel Management in Switzerland. I come from a diverse and multicultural background which makes the industry so appealing. It gives me the chance to work with people from all corners of the globe in addition to giving me the freedom to move. My career has only just started as I graduated in December 2016. The critical question before I graduated was; do I go and work for a recognised hotel brand or try a different path within the sector? It was a difficult choice as I have had the opportunity to work at great companies including one of Britain’s most famous hotel, The Savoy in London, and Swire Hotels in Hong Kong. In the past 4 years, I have worked every role in a food and beverage operation. This included serving afternoon tea in the Thames Foyer at The Savoy to helping plan, open and run Mr & Mrs Fox, a 12,000-square foot, 3 storey restaurant at the heart of Taikoo Shing, Hong Kong. How did you end up at Winnow? In my last year at Les Roches, I got involved in the Future of Hospitality Summit, Europe’s largest student run event focusing on innovation and technology in the hospitality sector. I was in charge of building the entire agenda and inviting keynote speakers and workshop holders. By chance, I attended a presentation given by Accor Hotels on campus that mentioned Winnow was helping them achieve their CSR targets. It was a great piece on how Winnow was helping Sofitel Bangkok become more profitable and sustainable by using technology to reduce their food waste. I ended up inviting Winnow to the summit in Switzerland where we met and the rest is history. Winnow’s technology allows those managing teams in commercial kitchens to have data backed insight of what is being thrown away. For those that haven’t had the opportunity of working in commercial kitchens, they often underestimate the scale of production. Without the data that gets sent to the decision makers, the Executive Chef or Head Chef, it is becomes extremely difficult to make changes on scale and for the long term. During our “Train the Trainer” sessions, it equips the Executive Chef or General Manager with the tools and information to train their team on the Winnow system, we stress the importance of tailoring the message to the individual on their team. For instance, some may be interested in improving their skills and getting more creative in the kitchen. With the Winnow system it allows them to do this as before they were focusing on quantity but now they can focus on the quality and on items they want to create. A piece of positive feedback that was given back to us by a vigilant Head Chef was that he successfully used the reports to identify an upward trend in his meat trimmings. It turned out that the quality of the meat from his supplier had been steadily decreasing. The reports gave him the necessary leverage to have that conversation with the supplier and negotiate for a higher quality product. I work directly with Compass Group UK, the largest catering company in Britain and one of our first clients. They are the only catering company in the UK to set a food waste reduction target to date. How do you see the UK hospitality industry changing in the next 3 years? With the changing political climate and Brexit less than two years away, the hospitality industry aren’t the only ones mitigating for the near future. People are now actively talking about increase in food prices and potential reductions in food waste to save growing food costs. With the looming exit from the European Union, be it Hard or Soft, the potential for supply chains to be disrupted by Brexit is vast. Reshoring, the process of bring offshore operations back home, will be boosted as the industry starts to look for British replacements.